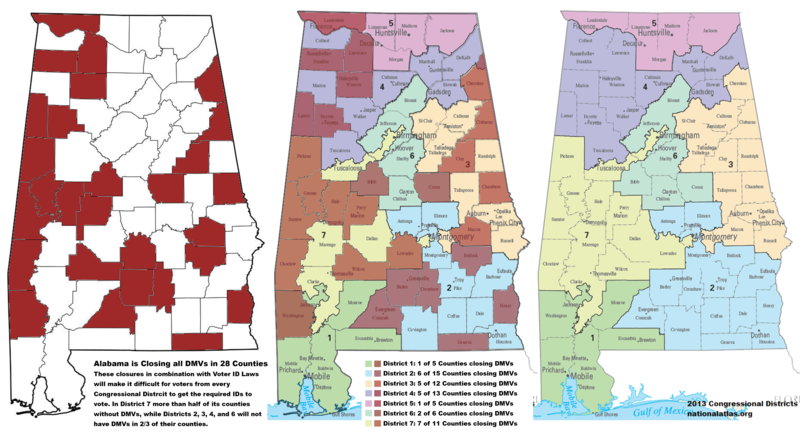 Alabama has announced they will be closing DMVs across the state despite the Voter-ID Law that took affect in 2014. The State plans to close all, but 4 DMVs by March 2015. 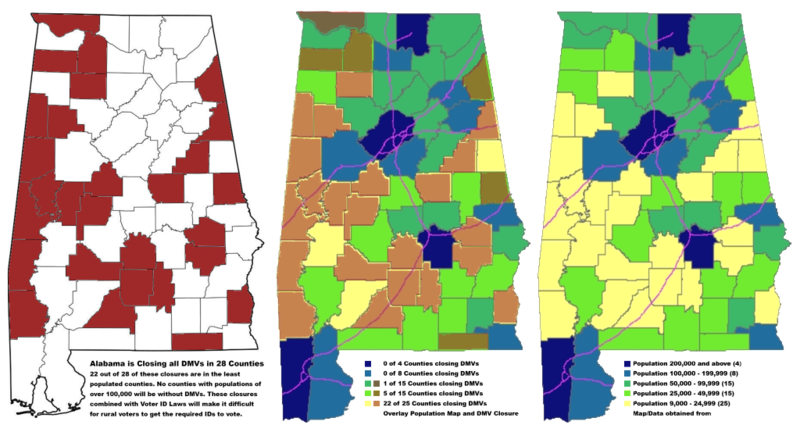 Alabama’s Voter-ID laws went into effect on June 13th, 2014. They require Alabama voters to show a valid government issued photo ID at the polls or to mail a copy with an absentee ballot. The first Alabama election following the law’s implementation had the lowest voter turnout in decades, but was still hailed as a success by the laws supporters simply because not enough people showed up to the polls and complained. The Poor- less likely to have a government issued ID, less likely to have the financial and travel resources to get one, and less likely to have needed documents to apply for one. Minorities- minorities are disproportionately living in poverty everywhere in the US, but it’s an even bigger disparity in the South. Woman- more likely to have last names change (making their IDs invalid for voting) and more likely to live in poverty. The Elderly- more likely to be poor, less likely to have a drivers license, less likely to be able to travel to get one, less likely to have needed documents to obtain one. Young Adults- Less likely to have driver’s license and less likely to have the financial and travel resources to obtain one. The DMV closures will make it that much more difficult for these demographics to obtain a valid ID which is required to vote in-person or absentee. This is especially true in Alabama’s Black Belt communities which is home to many of our nations poorest counties and statistically more likely to resemble third world nation more than a modern industrialized one. The first wave of DMV closures will leave 28 Alabama counties with out a place to get a State ID or Drivers License. They plan to close all, but 4 DMVs by March, 2015. 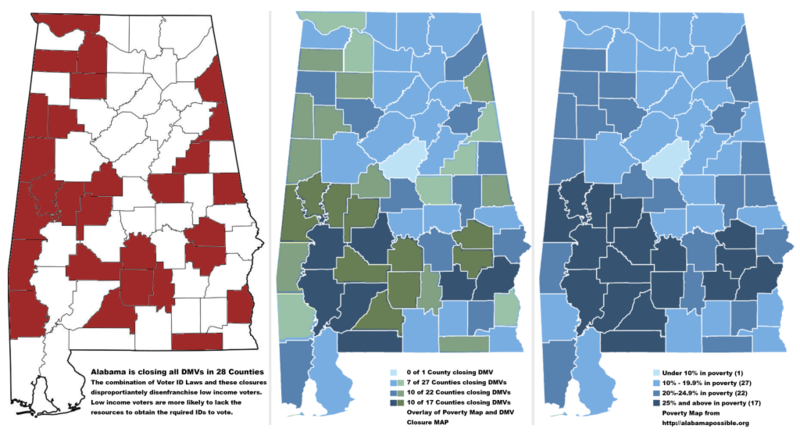 This would leave 40,000 (average number of Alabamians who use DMVs every year) driving longer distances and potentially experiencing longer wait times. 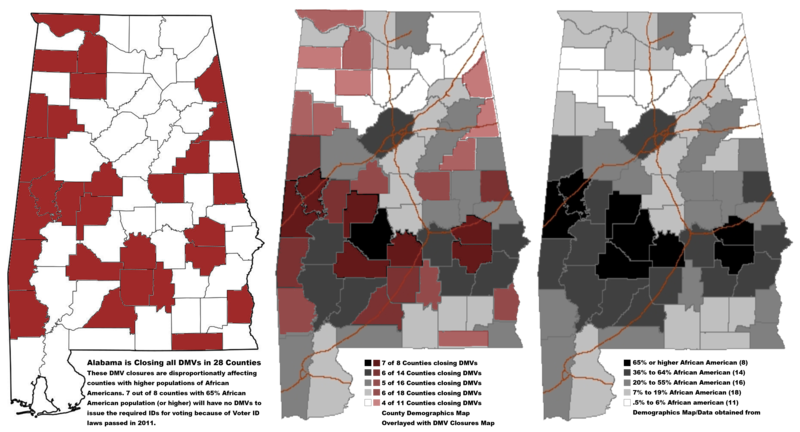 License renewals can be completed online, but families in Alabama’s poor and rural counties have some of the lowest rates of internet or broadband access in the nation. State officials site budget shortfalls for the DMV closures. In light of the Voter ID laws and the location of the counties that will be without DMVs, it is hard not to conclude that Alabama intends too make it very difficult for poor African Americans to vote. It is easy to argue that these cuts are not racially motivated. As most of the counties losing DMVs in this first wave of closures are rural. However, making it harder for these communities to get an ID that is required to vote, doesn’t make a whole lot of sense. Even rural living individuals who currently have a valid-ID will find it more difficult to renew once it expires than those who live in more populated areas. This is because they are less likely to have internet or broadband access. It also, just so happens that these same counties have the highest Poverty Rates. Congressional District 7 (Alabama’s only Democratic district in the last election) will see more than half of its Counties without DMVs. This is perhaps the most telling map overlay. In the first maps above (population), it appeared that perhaps there was some attempt to ensure that not every county in a particular region was without DMVs because of the way they spotted across some rural expanses. Unfortunately, this appears to just single out counties where the highest percentage of the population is African American. Seven out of eight counties where 65% (and greater) of the population is African American will be left without DMVs. In counties where the majority of the population is white, less than half of the counties will be without DMVs. Previous Previous post: Electronic Voter Fraud: Cause for Concern?